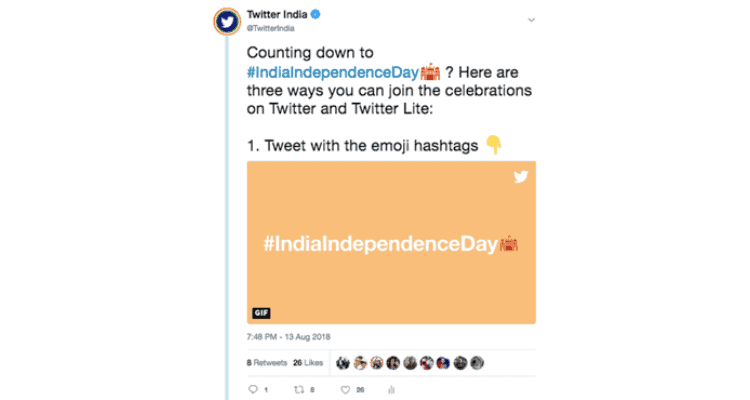 As India enters its 72nd year of Independence, Twitter announced the launch of Twitter Lite Google Play app in India as a way for more people across the country to celebrate #IndiaIndependenceDay and see what’s happening in India and the world. People can Tweet with#IndiaIndependenceDay to activate a Red Fort emoji on Twitter and Twitter Lite and join in the celebrations. In addition, people can watch the live stream of the Prime Minister’s speech and Independence Day celebrations on Twitter with @ANI, @AajTak, @abpnewstv, @CNNNews18, @economictimes, @CNBCTV18Live, @IndiaToday, @TheQuint, @BloombgergQuint from 7am onwards on August 15. Those who prefer a data-friendly way to follow the celebrations can look forward to live Tweet updates from @IndianExpress and @The_Hindu on Twitter Lite. These initiatives by twitter are conceptualized keeping in mind the sentiments and are a delightful way to reinforce a sense of unity and harmony amongst Twitter and Twitter Lite users. Data saver: Twitter Lite is accessible to people with data, bandwidth, and device constraints. Control which images and videos load on the phone by enabling Data saver. People can still load all this content at any time by hitting “Load image” or “Load video”, helping to save money and data in real time. Built for 2G and 3G networks: At 3MB, Twitter Lite saves data and space, and loads quickly on unreliable networks. While using the app on 2G or 3G, people will notice that content will load quickly on Twitter Lite and be able to see what’s happening no matter what network they are on! Bookmarks: Running low on data? Want to save a Tweet for later? Bookmarks is an easy-to-use feature that allows people to save important Tweets for later, for when there is more data or a better internet connection. Offline mode:Even when connectivity is temporarily lost, Twitter Lite will offer offline support. The user experience will never be interrupted as Tweets last cached will show even when a user goes offline. Push notifications:Starting today, Twitter Lite supports push notifications, allowing people to keep up with what’s happening around the world. Night mode:Night mode gives the timeline a darker theme, which is easier on the eyes and easier to read — even during the day. Threads: Following Twitter’s announcement last year, threaded Tweets are now available on Twitter Lite! We’ve made it easy to create a thread by adding a plus button in the composer, so people can connect their thoughts and publish threaded Tweets all at the same time. Twitter Launches Twitter Lite Google Play app 0 out of 5 based on 0 ratings. 0 user reviews.